I've been talking about how much the weather has sent me into a wardrobe rut, as I think it does for most people. Now that I can happily say we are fully in spring here in California, I have been re-assessing my wardrobe and taking in lots of inspiration in the hopes that I can perfect my spring/summer wardrobe. Especially since I'm more of a fan of cold-weather clothes, I find it hard to be really inspired by spring/summer collections, but with the winter this year lasting so long, I'm fully committed to having a really good warm-weather wardrobe. As part and parcel of not being a huge warm-weather person, I do feel a renewed sense of adding pieces that will get me out of my comfort zone (ahem vintage jeans and a t-shirt) and hopefully get me to experiment more with different shapes and fabrics. One of the most glaring examples of this that I can think of is injecting more non-denim trousers into my wardrobe. I wear denim almost every single day without fail, but that's a habit I want to get out of for spring. I'm definitely not saying I won't be wearing denim full stop, but I do think incorporating different styles of pants will make a huge impact on the kinds of silhouettes I wear. Whenever it gets to be the spring-time I tend to gravitate towards a much more feminine aesthetic, whereas my fall/winter wardrobe is far more menswear inspired. When I was having a closet clear-out recently, I noticed that there's a big hole in my wardrobe for more feminine tops and shoes. I gravitate a lot towards sweaters and cotton t-shirts for my top half and, for shoes, I love loafers and boots. However, for the spring time that combination can look a little too heavy. I really want to invest more in a few feminine blouses, especially wrap tops, since I think they are one of the most flattering shapes, and still look incredible with a pair of vintage jeans. For shoes, I've been hugely drawn to slingbacks, because even though they're still flats they look far more feminine than a loafer or a basic slide. Last, but certainly not least I want to touch on my intense, newfound love of linen. I've been seeing lots of images of linen clothes floating around Instagram and Pinterest and I can't quite put my finger on it, but there's something about it that just looks so effortless and cool. I bought this linen shirt from Everlane a couple of weeks ago and it has quickly become one of my favorite shirts. Not only is linen extremely pretty, but it's also easy to take care of, which makes it that much more enticing to wear for the warmer months. I will definitely be keeping an eye on some good linen pieces for the upcoming seasons. Who knows, a pair of linen pants might even be in the cards! It's no secret that I am obsessed with denim. 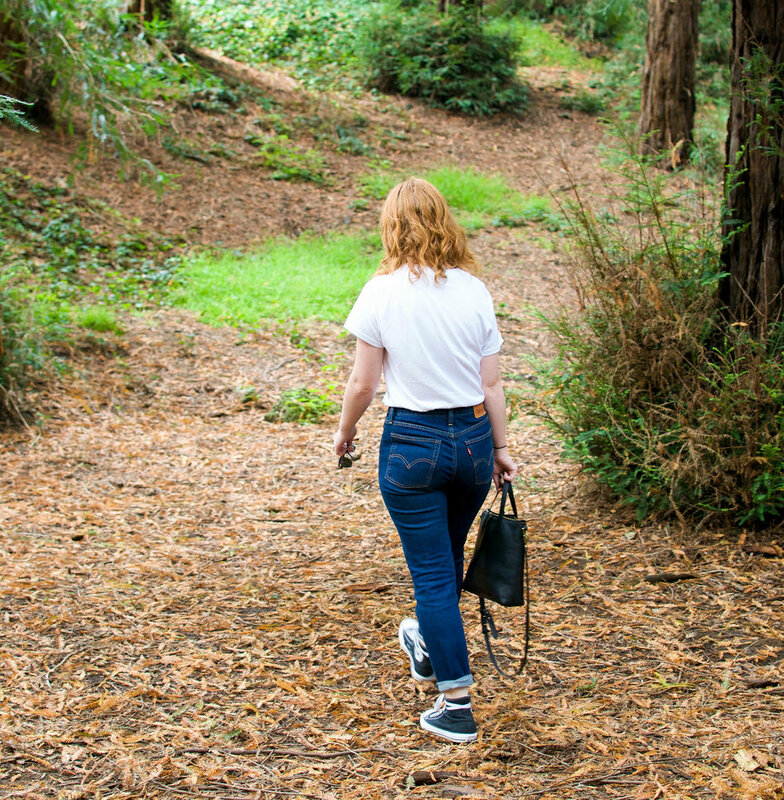 I wear denim almost every single day on my bottom half and, because of that, I have really narrowed down what I look for in a pair of jeans. 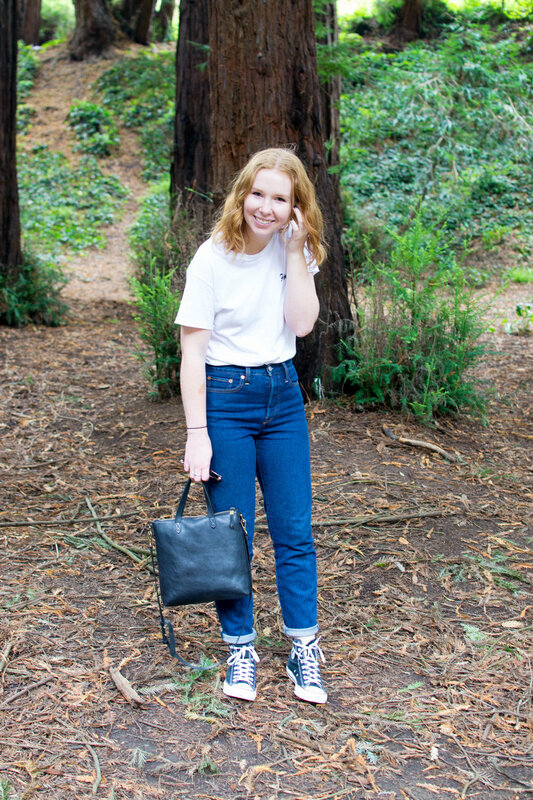 My all-time favorite jeans have to be vintage Levi 501s, and while I did write an entire blog post detailing my tips on finding the perfect pair of vintage 501s, I wanted to talk about the jeans that I love that are readily available for you all to go and buy should the denim-buying mood strike you. With the rise in popularity of vintage 501s, Levi's has done a phenomenal job at trying to recreate the integrity and silhouette of their iconic vintage denim. That is definitely the case with their Wedgie Fit jeans. These jeans have a slimmer silhouette than 501s, however they maintain the vintage look with their rigid denim, high waist, and tapered leg. The Wedgie Fit jeans are some of the best jeans to get into if you are a die-hard skinny jeans wearer but want to get more into wearing straight leg jeans. I have a few pairs of these and I foresee myself wearing the dark indigo wash a lot during the fall and winter. Up until about a few months ago I only would wear straight, skinny, or boyfriend fit jeans. The thought of wearing a bootcut or a flare jean brought back some not so pleasant sartorial memories of wearing low rise bootcut jeans as a kid in the early 2000s. I had seen images floating around on Pinterest of bloggers wearing flared jeans, and while they looked incredible I doubted how they would look on me. However, the Madewell Cali Demi-Boot jeans have changed my opinion on flared jeans for the better. I have a pair of these jeans in a typical denim blue wash with a frayed hem, but the washed black with the exposed button fly pair are my favorites. These jeans are relatively skinny fitting over the thighs but have a gradual kick flare starting below the knee. Because they are slightly cropped as well (they hit just above my ankles and I am 5'6 for reference) they make for a very versatile piece, if you find yourself struggling to find a flared jean that goes with a variety of shoes. Last but not least is the newest pair of jeans to my collection, however they have quickly become my favorite skinny jean (and believe me I've tried my fair share). Everlane launched their denim about a month ago now and like everything the brand does, every step of making this denim has been done in an ethical and eco-friendly way. These jeans are 98% cotton so they have an incredible structure to them and don't feel like super stretchy jeggings, which I absolutely hate. While these are definitely a skinny jean they aren't skin tight so they don't have that sprayed-on look that so many skinny jeans nowadays have. 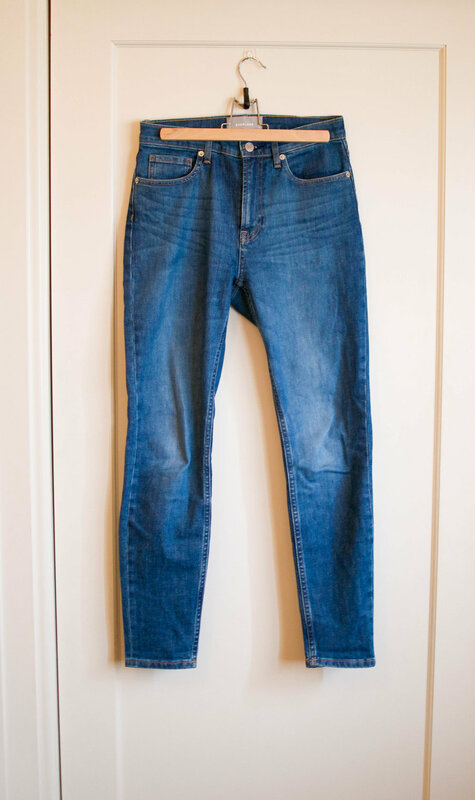 Considering these are $68, they are also some of the best quality jeans (they sit up there with Levi's in my books) I have since they are made of Japanese denim, which is pretty much the gold standard in the denim world. What are your favorite jeans? As of now I am thoroughly over Summer. I have never been the biggest fan of Summer to be honest, which I think partially is down to the fact that I've never loved hot weather. Because of my aversion to higher temperatures I've also never been too keen on dressing for the Summer months. Luckily, having grown up in San Francisco, I never developed much of a Summer wardrobe because, well, we don't really have summer the way the rest of the world does. Most of the summer months consist of dense fog and some pretty heavy winds. Even though I'm not in the throws of hot weather, I still am eager for it to be Autumn because not only is it my favorite season, but it also brings with it Autumn clothing coming into stores. I find shopping in between seasons to be near impossible because, more often than not, the selection just isn't too great. I tend to be drawn to classic, timeless pieces especially during transitional times because they also often coincide with being in the middle of a style rut. While it can feel a bit same-y at times, I think its nice to go back to basics sometimes and really hone in the pieces that work best for you. These in-between times are when I find myself shopping my own closet a lot more and therefore have nailed down a solid selection of pieces that work perfectly for the often awkward transition from Summer to Autumn. One of the staples in my transitional wardrobe is a pair of straight leg jeans. 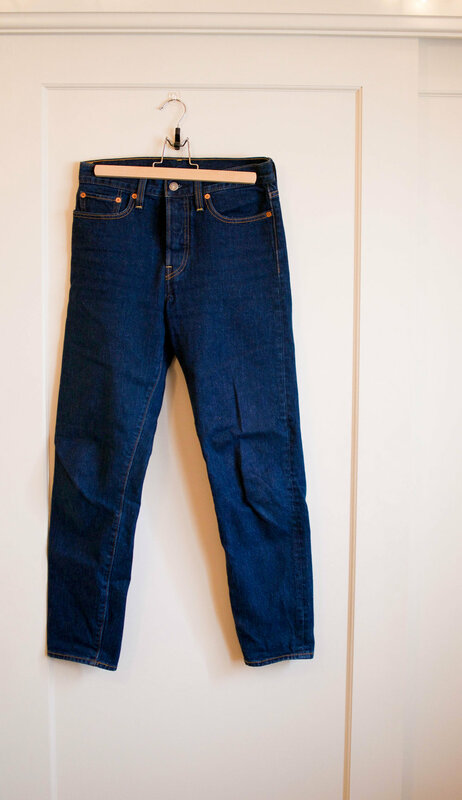 This particular pair pictured are the Levi Wedgie Fit Jeans, which are a great options if you are either struggling to find a good pair of vintage Levi 501s or if you are new to the realm of straight leg jeans and want a pair that err more on the skinny side. I've had a few pairs of Levi Wedgie jeans and this wash is by far my favorite for the transition to cooler weather The deep blue wash goes so well with both light and dark tops, but also looks a bit more formal with the right outfit. Because of the silhouette of straight leg jeans, they lend themselves to a variety of tops like a plain white tee (as pictured above) or a chunkier knit. A pair of classic black Converse High Tops also are one of the best items in a transitional wardrobe. They are definitely a casual shoe, but they work with so many different outfits whether it be a classic jeans and t-shirt look, a girly wrap dress, a pair of trousers; the possibilities really are endless. Because of their versatility, they work during this in-between period perfectly because they are such a reliable and iconic shoe. During the transition between Summer and Autumn, most people aren't also super worried about wearing shoes suited for very cold weather, but also don't want to be wearing a shoe with an open toe, which is the ideal situation to wear sneakers. I think that any kind of fashion sneaker is a must-have for transitional seasons, but Converse High Tops are without a doubt my favorite and the most comfortable (that I have found) in the category. A leather biker jacket makes for the perfect outerwear piece during transitional seasons. This is in part because leather biker jackets go with everything, from jeans and a t-shirt to a wrap dress. Because they are so versatile its a piece that you can rely on no matter the weather or the occassion. Another great thing about leather jackets is if you don't already own one, they are almost always available no matter what the season is. Even though the leather jacket I own is on the thicker side, it has been my go-to outerwear piece for cooler evenings and days, and even when it's a bit warmer I can justify wearing it with a lighter top underneath. Perhaps one of the best transitional pieces is a lightweight wool turtleneck. My favorite turtlenecks are from Uniqlo as they are both the perfect cut and they're only $30. While these are wool, they are a much lighter weight wool than a lot of other wool turtlenecks on the market and you don't feel like you're dying of heat exhaustion if the temperature rises above 65 degrees. Because of the ribbed texture, they sit in a super flattering way against the body and don't sag or look awkward in any spot. The tight fit of them makes for the perfect layering piece, in fact one of my favorite outfits, which I'm sure I'll feature in the near future in an upcoming post is this turtleck with a lacey cami over the top, tucked into some black trousers. Again, like the leather biker jacket, you can also wear a wool turtleneck for almost any occasion as well, which makes it perfect for this time of year. I'm just gonna put it right out there, I don't believe in the capsule wardrobe. I'm fully into the central idea of the capsule wardrobe that your wardrobe should be as edited as possible, however I personally will never do a capsule wardrobe because of where I live. Because I live in California, Northern California no less, there aren't concrete enough seasons to justify having separate wardrobes for each season. For example, during the month of September alone it can go from being 80 degrees one day to being full-on cold fall weather. For me it just doesn't make sense to tuck away a good portion of my wardrobe when the weather can turn on a dime. With all that said, I've narrowed down my wardrobe philosophy that is best described as an intentional wardrobe. The logic is very similar to the capsule wardrobe in that I regularly edit the pieces in my wardrobe to the point where I have a collection of clothes that are easy to style together and I'm never left with that "I don't have anything to wear feeling in the morning". Also when it comes to buying clothes I am much more rigorous with myself and make sure to only buy pieces I know will last a long time and will fit into the wardrobe that I already own. I have made the mistake one too many times of buying something and never wearing it because it just doesn't fit with the other pieces I own. I feel like the capsule wardrobe has the right idea in editing and focusing a wardrobe, I just don't find it necessary to restrict myself so much by the seasons and the weather (although for people that live in places where there are distinctive seasons I can see why the capsule wardrobe is appealing). I also enjoy bringing in pieces that are for a different season and reworking them with another piece so that it works for the weather. For example, I have a black slip dress that is amazing for warmer weather but because it is short enough, I can tuck it into jeans during the cooler months and layer a turtleneck underneath it so it works as a more wintery piece. All in all this approach to thinking of my wardrobe methodically and with a stronger direction has really helped me hone in my personal style and keep me from buying clothes just for the sake of buying clothes. For as long as I can remember, I've always loved clothes and fashion, and I've always had a very strong vision of what I like to wear. However, that's not to say that my style has stayed the same, in fact it has changed quite a bit especially in the past year. I think that is mainly down to the fact that I 1. have started to feel more like an adult than I ever have before and 2. because I have started to consume more and more fashion content. I thought today I'd share a few tips on what I found most helpful to hone my style. Do a Thorough Wardrobe Clear-Out ~ When I really got an itch to revamp my wardrobe I started out by clearing out everything in my closet, and by everything I mean everything. When I had everything laid out I realized how much stuff I had in my closet that hadn't been worn in years. I had shirts that I had not worn since high school and so many other things that just would not fit my aesthetic at all now. I would recommend taking everything physically out of your wardrobe/closet/drawers just so that you can see everything and consider every piece to either keep or get rid of. It has also helped me to do pretty consistent clear-outs on a smaller scale if I don't find myself wearing certain pieces or if I want to replace something that already exists in my closet with a newer or better version. Take Inspiration from Everywhere ~ I think taking inspiration from everywhere has really helped me hone in my personal style, because at the end of the day I think that what you wear is a direct reflection of your personality and interests. I personally take a lot of my inspiration from the music I listen to and my parents. I am a big fan of rock music, especially 60s and 70s rock like The Beatles, the Stones, Bob Dylan, The Doors, The Ramones, and the list just goes on and on. I love the toughness of rock music and emulating that in my style and combining it with slightly more feminine pieces has made me really be able to express what I like beyond just fashion. My parents also are big influences on my fashion. A few months ago I found an amazing picture of my dad in the late 70s wearing the most amazing white Levi 501s. I've loved Levis for as long as I've been wearing jeans but that picture really made me love 501s that much more, especially since 70s fashion is back in style. My mom's philosophy of buying classic tailored pieces(oh and not to mention her intense love of black boots) has also been a massive influence on my style. I don't buy much trend-driven clothing, but rather interesting and well-made basics that are versatile and can be dressed up or down. Devour Fashion Content ~ As I mentioned before, I've been consuming even more fashion content than I did before. I've taken more interest in it and found it so much more entertaining than I ever have in the past. I watched a video with Camille Rowe and British Vogue where she goes through her closet and explains her fashion philosophy, which is very much in-line with mine, where she prioritizes comfort over everything and likes to elevate the most basic outfit like jeans and a t-shirt, with fun vintage tees and amazing-fitting jeans. I also love Lizzy Hadfield, for really interesting takes on rather minimalistic outfits. Lizzy's instagram is absolutely incredible, her blog is incredibly well-written, and her YouTube videos on testing fashion basics are amazing and so well-thought out. Anna fromThe Anna Edit also has great taste and really focuses on basic, classic pieces that look really smart and minimalist. I've found that consuming a lot of fashion content has re-inspired me to be experimental with my wardrobe, while allowing me to really pick out styles I do like and styles that I don't think would be best suited on me. Play Dress-Up ~ After I did my full wardrobe clear-out and found new ideas for outfits, I took it upon myself to try on as many outfit combinations as possible. I also made a concerted effort to use the inspiration I had found on the fashion bloggers and accounts that I had seen to put together pieces that I had never put together before and see if they worked. I found this really helpful for cutting down on feeling the urge to fill holes in my wardrobe because sometimes pairing a piece with a piece you wouldn't normally pair it with is enough to see the piece in a totally different light. For me, this was the most crucial part in honing in my style because it allowed me to use the clothes I already own and experiment with them so I'm not getting stuck in a fashion rut.